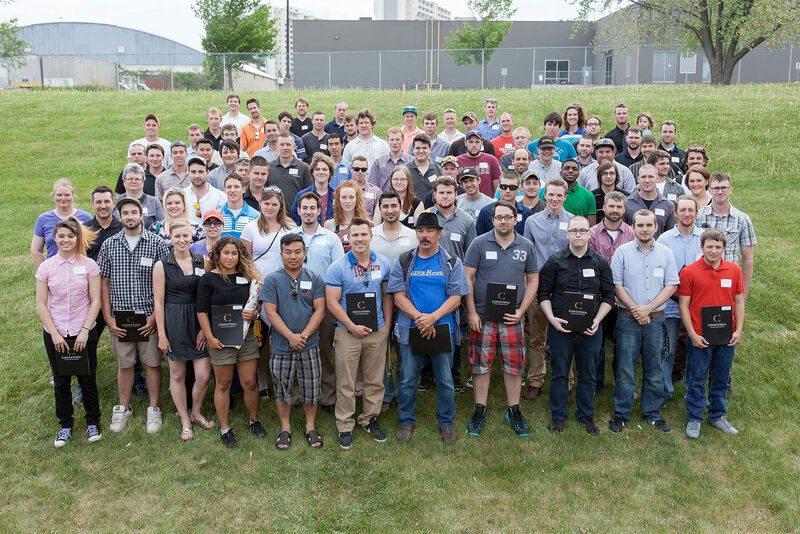 Close to 150 industry and donor-sponsored awards, valued at over $124,000, were presented to students at Conestoga’s sixth annual Trades & Apprenticeship Awards presentation and barbeque on May 27. Julia Biedermann, executive dean of the Schools of Engineering & Information Technology, Trades & Apprenticeship and the Institute of Food Processing Technology welcomed students, family members, donors, faculty and program advisory committee members to the event. The awards presentation recognizes outstanding student achievements in a variety of skilled trades areas, including motive power, construction and industrial. The presentation, believed to be the largest trades and apprenticeship awards ceremony in Canada, was held at the Roofing Skills Training Centre at Conestoga’s Waterloo campus. Moyer also acknowledged that achievement and success are rarely individual accomplishments. She offered thanks to program advisory committee members who generously donate time to support programming throughout the year and award sponsors that allow Conestoga to recognize excellence in the trades. The number of awards presented, and their value, have more than doubled since 2010. Among the new awards this year were 15 motive power student awards, valued at a total of $30,000, which were donated by the Princess Auto Foundation. Marks also noted that the single biggest issue facing his industry - construction - is lack of skilled workers. He praised students for their decision to enter the trades at a time when their training and skills are needed. The School of Trades & Apprenticeship delivers a comprehensive array of skilled trades programs through campuses and training centres in Kitchener, Cambridge, Waterloo, Guelph and Ingersoll. For more information, visit the School website. To see the list of winners from each category, please visit the links below.